Grace Bonney over on Design*Sponge did a wonderful post this week on modern etiquette for the host and guest when visiting. It is an excellent read and full of wonderful suggestions like what bedside items to assemble for your guests. I found the post excellent but was thoroughly entertained by the huge number of comments. I would not have thought of this as a subject that could generate so much controversy. The excitement centered around a few main topics. North vs South and manners. I though some commenters were set to start another Civil War over the issue of which geographical region can claim better true manners. Shoes on or off: This was a huge topic. Do you allow guests to wear shoes in your home and if you don't are you expected to provide slippers or funky socks, or give guests advance notice that this is your house rule? People are passionate about this. I am not. I prefer to wear shoes but I'll gladly kick them off if that is the custom. To strip the bed or not at the end of your visit. Again such a minuscule problem to generate so many comments. Grace states that "For me, etiquette is all about learning simple tools and tips for making the people in your life (and your home) feel welcome, loved and comfortable." I'd like to add that etiquette has to include common sense and flexibility. It can vary for different situations. I did weigh in on several topics and included the following suggestions in the comments section of Grace's post. 1. Power Strip with surge suppression. 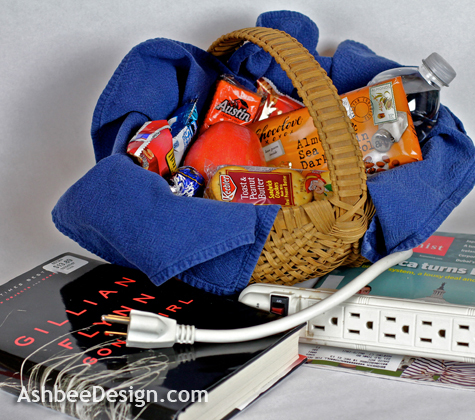 I have put one the the guest spaces in our home because everyone comes with a bizillion things needing charging. I don’t want them on my kitchen counters! I also pack one in my bag because even hotel rooms don’t seem to have enough convenient plugs for both my husband and me. 2. Soup! When entertaining overnight guests I always make a big pot of savory soup and have it available in the fridge. I tell the guests that it is their for them to help themselves whenever they are hungry. We generally eat around 8 PM and that is too late for many. They might have a bowl of soup at 5:30, or for lunch, or a late night snack. some have even chosen it as their breakfast. Here is a link to my post on one soup for company (with recipe!). And weighing in on the changing of sheets – My opinion is based entirely on who the company is. I was visiting the ski home of my son-in-law’s family. Clearly, during the ski season this beautiful home is filled with revolving guests. The hostess put the next change of sheets in every bedroom and on your last day it was the guests’ responsibility to change the bed and bring the dirty linens to the laundry room. Such a smart solution for providing a way for everyone to help. Now, in my house, when the kids come home, I do the same thing. When they leave, there are clean sheets on the beds. For others, it depends on each guest (and how many!) as to weather they get the sheets or not. As with all good rules, they are applied with consideration! I change the sheets after the guests leave because there have been times when guests turn around and come back - a child was sick, there was car trouble, etc., etc. A freshly made bed would be used again and need changing again. So I never change sheets until I know the guests are too far away from my house to make turning back a feasible option. I had this funny experience the first time I visited a friend, got a freshly made bed (kicking her daughter out of the house) and after one night asked her if she wanted me to strip the bed. "Why, do you have by chance any contagius illness?" At first I felt unconfortable with this, now that my kids have friends sleeping over any day of the week, and they all love sleeping together in a big bed, I change their linnen only when needed. A friend's kid without known germs cannot be sicker or dirtier than my own kids. Wonderful story! And proves the point about being flexible. I did things very differently with the kids and friends - in fact, they seldom slept in a bed. Curled up in piles of pillows on the floor was more their style.